The Dressmaker by Kate Alcott - This one has been on my reading horizons for a while now, but we are going to be doing a Titanic special at Historical Tapestry so I needed something to read for that so I had to borrow it. 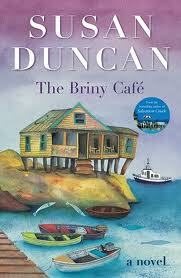 The Briny Cafe by Susan Duncan - For the Australian Women Writers challenge. I had actually read about 50 pages of it previously but had to return it. 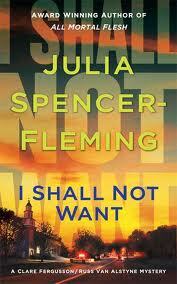 I Shall Not Want by Julia Spencer-Fleming - The next book in the Reverend Clare Fergusson and Russ van Alstyne mystery series. I LOVE the cover of The Briny Cafe. After reading the book's blurb, it is now on my TBR list. 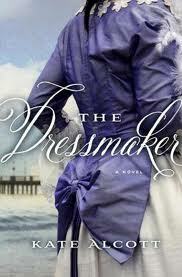 I really, really want to read The Dressmaker. I have been seeing it around, and need to request it from my own library! The Dressmaker is on my tbr list too. Enjoy your loot. These all look interesting - enjoy! I'll look forward to your thoughts on The Dressmaker - I think it looks very good. I am looking forward to The Dressmaker! The Susan Duncan looks funand I hope you'll enjoy The Dressmaker . Happy reading!